Of course, we’ve all heard of the urban legend tale “The Poisoned Dress” or “Embalmed Alive” about the young woman who dies after absorbing embalming fluid from a used dress. And if you’ve ever seen that noirest of films, The Loved One, based on Evelyn Waugh’s novel, you may remember Miss Aimée Thanatogenos, who embalms herself. I’m not a fan of needles or trochars so this is a subject that makes me queasy. Thankfully the near-embalmed is not a large group, and those embalmed alive are mercifully few. Yet two cases with a remarkable similarity to the Russian tragedy occurred in Norfolk, Virginia in 1929. On 17 May 1929, a modest notice in The Independent newspaper of Elizabeth City, North Carolina told of funeral services held for Mrs. Ruth Garrett, 36, wife of Cecil F. Garrett, “who died in a Norfolk hospital at 10:45 Sunday morning following an operation.” She died on her birthday 12 May. But early in June, The Independent, tipped off by a confidential informant inside the hospital, began a relentless campaign to uncover the truth about Mrs. Garrett’s untimely death. Mrs. Garrett, 36 years old, was one of the healthiest young matrons in Elizabeth City. Her sudden death in St. Vincent’s Hospital on May 12th stunned everybody who knew her. But her husband suspected nothing wrong until weeks afterwards. Murder will out. Mrs. Garrett’s personal doctor had discovered kidney disease and referred her to Dr. R.L. Payne of Norfolk, who recommended injections of an antiseptic silver nitrate solution. The first injection went smoothly, but the second caused her great pain. Despite this, she waited another two weeks to see the doctor, when it was discovered that one kidney had been destroyed and the other was badly damaged. An operation was hastily performed to remove the dead organ; the other kidney was too far gone and Mrs. Garrett died on Sunday morning, 12 May, 1929. But the newspaper was far from satisfied with the Coroner’s investigation and report. Mr. Garrett retained a lawyer, but. But Cecil F. Garrett, Husband of Woman Who Was Embalmed Alive, Will push The Matter To Its Limit. A special Norfolk grand jury last week investigating the death of Mrs. Cecil F. Garrett of this city, who died at St. Vincent’s Hospital in Norfolk after an operation following an injection of formalin from a bottle labelled nitrate of silver failed to find sufficient evidence to bring charges against anyone and was dismissed by Judge W.H. Sergeant in Corporation Court. Cecil F. Garrett, husband of the dead woman, told a representative of this newspaper this week that while he was satisfied that the grand jury was composed of intelligent and conscientious men who discharged their duties the best they could and that he was satisfied with their report, considering the evidence they had gathered, he would not be content to let the matter drop. He stated that his attorneys were still investigating and that some sort of suit would eventually be started against someone. In commenting on an article in a Norfolk paper quoting him as saying that it seemed that there was an unfortunate error in making up the prescription in the drug store or laboratory and that he held no one to blame for the unfortunate error, Mr. Garrett absolutely denies that he said anything of the kind. “The reporter just assumed that I said these words from a former statement in The Independent where I said that there had been an unfortunate error made,” said Mr. Garrett. But there was something lacking at the hearing that grand jury. There was one Sister Evelyn Fitzsimons, who was in charge of the hospital pharmacy where the bottle labelled “Nitrate of Silver” was filled with a solution of formalin. A few days after the death of Mrs. Garrett from the fatal injection, Sister Fitzsimons’ health became bad and she had to be sent to St. Joseph’s Hospital in Philadelphia. She was not available at the grand jury investigation. Another nurse was ill from an operation and could not be present at the investigation. She was a Miss Eggleson. Had these two important witnesses been able to attend the investigation and shed what light they could on the terrible death of a woman who was embalmed alive, the report of the grand jury may have been altogether different. But they were ill and the grand jury did not wait. The whole thing, as terrible as it was, has been hushed up by the hospital officials and by the Norfolk coroner, as best they could Mr. Garrett feels that if Coroner C.D. J. McDonald of Norfolk had fully discharged his duties in the investigation of the death of his wife, the grand jury would have had something more to work and that their report would have been different from what it was last week. “I am going to push the matter just as far as I can,” says Mr. Garrett. “Not that I can get any satisfaction in the prosecution of the guilty parties, but to fulfil a duty that I owe the general public. Norfolk officials would probably never had done as much as they did in the investigation of Mrs. Garrett’s death had it not been for the fact that The Independent gave the case relentless publicity, presenting the facts to the public in a way that made the officials feel that they had to do something. Mrs. Garrett was not the only one to receive an injection from that bottle of fatal formalin. The solution in the bottle was used on one other occasion before it was used in the case of the Mrs. Garrett; and that other case is believed to have been Mrs. Marie McLemore, a niece of Mrs. M.M. Spruill of this city. Mrs. McLemore died after an operation in St. Vincent’s Hospital in April [28 May, actually] and the circumstances surrounding her death were similar to those in Mrs. Garrett’s case. But the grand jury did not go into the McLemore death further than to ask a few questions and the people of Mrs. McLemore are reluctant to push the matter. While Mr. Garrett seemed to be making no headway, Mrs. McLemore’s people filed suit. “Nothing much will come of the suit against St. Vincent. St. Vincent’s is a semi-charitable hospital and enjoys a certain immunity in law. Cecil F. Garrett of this city started a suit against St. Vincent’s but made no progress. And there the grim story ends. I assume that “compromise” was reached in both cases; I could find nothing more about lawsuits or settlements. But grief sometimes overtook common sense. There is a peculiar detail in this next story of partial embalming—that the undertaker would begin the embalming process with “weeping friends” in the room. It was bad enough when unembalmed persons in cataleptic trances awoke in their coffins while being transported to the graveyard. It piles horror upon horror to imagine being in a trance, able to hear what was going on, as the undertaker draws near with his needle…. East St. Louis (Ill.), January 14. Mrs. Christina Hirth awoke from a trance in the “dead-room” of the County Hospital today. Only by a slight motion of her eyelids was she able to make life manifest to the undertaker who was busy embalming her. This faint quiver was sufficient to throw a weight from her eye and thereby saved her from death by embalming fluid, or, escaping that, by premature burial. Mrs. Hirth is 53 years old, and for three months has been suffering from a complication of ailments that have greatly weakened her. Last night it was expected that she would die, and her husband remained at her bedside all night. This morning she grew much weaker, and with a deep sigh seemingly expired. The county undertaker was called, and the supposed corpse was taken to the “dead-room,” the body was laid out, washed, and partially bleached. Cloths saturated with bleaching fluid were placed over the face and body. The shroud and clothing in which she was to be buried were prepared. While busy with his preparations to inject the embalming fluid, the undertaker was startled by a noise proceeding from the direction of the supposed corpse. He glanced hastily, but there was no motion in the white-sheeted figure. When he came to remove the sheet from the face, however, he noticed that one of the weights had fallen off. 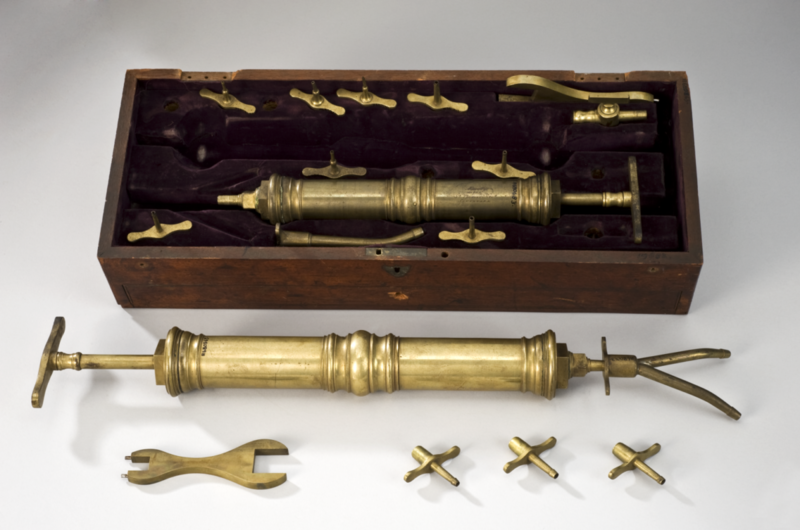 In replacing it he thought that he detected a quiver in the eyelids, but, attributing it to his imagination, went about preparing his instruments for the injection of the embalming fluid. He was about to inject the fluid when again he noticed a quiver, and then, to be thoroughly satisfied, he applied the most powerful test of life known to undertakers. There was an unmistakable though faint indication of the life in the response. Assistance was summoned, the partially embalmed woman was removed to a bed and restoratives were applied by doctors. She was able after several hours to speak in a whisper and move her muscles, but weakness, caused by her illness and the terrible ordeal through which she had passed, told heavily upon her, and she could make no statement as to her experiences while in the trance. From signs it is supposed that she realized how near she was to being embalmed alive. If we merely took keyword frequency as an indication, we might think that being “embalmed alive” was a commonplace occurrence. But the phrase was sometimes used in the jocular sense of being drunk. And there are astonishingly large numbers of stories of people who died when mistaking embalming fluid for liquor. Northumberland, Pa., Jan. 9. James B. Dieffenbach, secretary of the board of health and superintendent of the local water works, felt chilly and swallowed from a bottle which he thought contained whiskey. The fluid was embalming fluid or formaldehyde. Undertaker’s Clerk Mistakes Deadly Fluid for Whiskey. Paterson, N.J., Feb. 7. Mistaking a pint flask of embalming fluid for one containing whiskey, William J. Cantwell, night clerk in the undertaking establishment of Robert R. Nichols, drank enough to make “four fingers.” He was found dead in bed at 8 o’clock next morning by Nichols when he entered the rear room of his office.